I have the oak cabinetry from the 80’s. The only good thing about it..it has good lines and is crying out for white paint. That means it has been crying for awhile. Lately its been downright sobbing. I laughed throughout this entire blog. You are so funny! I’m totally subscribing, which I NEVER do. Love this! Sweetie, you’ve never seen my kitchen. 1985 British Racing Green cabinetry and benches, low voltage track lighting, permanently stained and lifting wooden flooring, and bench space narrower than a dinner plate. Every door opens opposite to the direction it should and we have only FOUR power points. It’s a dark, sad, little pit – and we’re in a rental, so we can’t change it. That said, we live in Germany, so it’s lucky we had a kitchen at all in our rental – yes, German rentals come WITHOUT A KITCHEN because you bring your own kitchen with you. Of course you do. Love watching your updates and I swooned considerably over the pictures in your post. OMG Kristy…I would say we have the same kitchen…except mine is in California. so sad…so very sad. Mine is a rental also so no changes…we just adapt and cook some awesome meals in it. I have made it clear to my sons that they are never to expect any woman in their future to accept such a kitchen. They are beautiful kitchens, and I suppose I could paint all my fake oak woodwork white (I don’t even have 80’s oak, I have 80’s faux oak!) and then it would match my Formica. Which I could then paint wiggly grey lines on, to be faux marble. But I think instead I will take up your idea of Kitchen Acceptance. It goes better with my lackluster cooking. This is my life, too. That’s nothing. My house was built on the intention of faux oak woodwork, but it wasn’t in the budget. The result was that it was built in faux faux oak, which for those who don’t know, is real oak made to look like faux oak to look like real oak. Nothing less than a tragedy. Truth being: There’s no woodwork for some reason, just 2 long open shelves that I’m going to tear down before moving in. The only positive thing about them is that they’re white. I guess they had to though, since any other color would probably clash with the strong lime green vinyl “tiles” on the walls. I wholeheartedly agree about this. My parents’ 1951 cabinets live on in their basement laundry room and are holding up better down there than the fancy new cabinets are upstairs. I thought about putting all my money into things that I care about, like old beat up doors and hardware and really fancy windows that undo the cosmetic damage of past replacements, and then completely cheap out on a utilitarian kitchen. I truly need a kitchen as the old one was both junk and glued to the walls, but we’ll see if I have the courage to use Formica. I would totally install an old kitchen if I thought it were remotely possible to find one that would fit. Chad, my home was built in 1951 & still has the original knotty pine cabinets & solid oak hardwood floors. Those are the things I fell in love with when I walked into this house more than 20 yrs. ago, & those are the things I’m keeping. They’re sturdy & beautiful, & nothing made today can even begin to compare to their quality. I might get around to refinishing them someday. Then again I might not. I’m happy either way & these are a few of the little things that elicit happy memories & lend a sense of “home” for my children when they visit, & these are things that money can’t buy. Nice faucet! How about you do all of us a favor and redo your kitchen on a budget, but yet make it look beyond fabulous??? We would be much more dazzled by that, than someone who spends $50,000 to $100,oo0 on a redo. There must be marble countertops on Craigslist that can be recut to fit your kitchen. I have every confidence in you. I expect something fantastic from you. Please don’t let me down! You know, my friend here in the UK did an Ikea kitchen and to be honest, it looks a lot like many of the first pictures VEB has posted here today – down to the marble splashback she found on an amazing offer. Her kitchen is bl__dy gorgeous and cost her (including appliances which are not from Ikea, and floors also not Ikea) under £12K. I think it meets the jaw-dropping challenge really-really well! I wish I could link to her snaps for you to see but she’s got it on private. But scroll up to 2nd and 3rd photos above, and you’ll be seeing the kitchen she achieved. I love your thought, Sunnie … but in my world £12K isn’t a BUDGET kitchen….. 🙁 I need something that’s more like US$3K…. over the course of 5 or 6 years ….! Door Sixteen takes this approach to kitchens, and she has great taste. She did an Ikea kitchen in her old house (because she’s opposed to blowing your budget on a kitchen), and it looked fabulous. (I also love Victoria, but just saying–there are “budget” bloggers out there.) Door Sixteen is much more “modern” in her tastes, though, so not sure she’ll appeal to everyone reading here. Do I detect a hint of sarcasm in the recipe of this blogpost? hehe I couldn’t agree more with you! Kitchens are just the latest trends and once we blow our life savings on redoing it, we’ll be told that the new trend is ultra expesnive bedrooms somehow…… I’m with you – don’t buy in! I’m convinced that all this is simply the Interior Designers’ Full Employment Strategy. Between the Internet and HGTV, we’re being conditioned to believe that anything more than five years old is “dated” (said with a curled lip), and that the proper response to “dated” is “demo.” Honestly, I can’t count how many times I’ve wished those people who insist on having the latest thing would give me the kitchen they’re tearing out! That would be a true repurpose…..a trash to treasure. I’ll take on of those tear out kitchens too! Haha! Looking forward to that post; you will excel at DIY marble mining! And at locating gluten-free pastries in Italy! I am with you on embracing the kitchen you have, even as I drool longingly over the pictures. Sooo pretty… WANT! I am pretty sure the kitchens you posted are bigger than my entire house. Imagine having to clean them. Every. Single. Day. I suspect that if you can afford one of those kitchens, you can afford to have someone else clean it for you. I KNOW! Every time I look at those I think.. ooh nice lights – how often would that glass need cleaning/stainless steel need polishing etc etc. Back to reality for me I’m afraid! Leigh, I agree. I also doubt that anyone cooks in them either. I would suppose the owner dines out all the time or has a full-time chef/cook with a housekeeper to clean up later. These are “show” kitchens, not real life kitchens……:) No refrigerator magnets, potholders, ugly grease splatter above the stove or hard water stain on the faucets……. Where’s the stack of junk mail? “This is my message for the day—acceptance.” Sing it sister!!! My bank account loves this post! simple” needs to be everywhere I go. I have a 90’s white kitchen composed of bottom of the line Merillatt cabinets with vinyl doors. I love it. You see the dirt quickly and can wipe up the smudges before they become part of the cabinetry. One of the ‘boxes’ of an upper cabinet collapsed from overloading and we did replace that with a genuine wood box (previous box was oriented strand board). Counters are Corian back when they had five colors. Floor is fake brick vinyl. No one has ever seen a shiny brick so I don’t feel guilty about not waxing it regularly. As I said, I love my kitchen and furthermore I was able to send my kids to college and I am enjoying a nice retirement. This post is long over-due and very welcome. Truth. AND funny. My kitchen is depressingly dated but this is not the home of our dreams anywhere else either. I am exceedingly cheap so a coat of paint, some new hardware and new Formica counters is just going to have to do. I am living proof that Kitchen Acceptance makes you happy! If it doesn’t make my guests happy they can go eat free food somewhere else! However, if you need a consultant to go to Italy to help you with the mining of the marble….I AM your girl! Oh, the whimsy of a daydream that subtly turns to potential violence of a remodel. Our kitchen thrives on harvest gold wall oven & stovetop. I can’t bear to toss them, for they still do what they are required to do. You just know as soon as they are taken away, their pictures will be in all the latest magazines. The cupboards are solid pine-a new finish would dress the girl up nicely, I think. Just not sure what to attempt. Once the sander starts, there’s no turning back. P.S.- I wish you would write a book or a series! I am forever entertained by your blog. Thank you for articulating what I think every time I watch a HGTV show, where some young couple whines, “oh, but it doesn’t have a granite countertop”. I have embraced my 1986 kitchen, oak, Formica and all. I shall enjoy family, good food and the occasional vacation, and maybe even retirement at 77! Hi Victoria, I think you’re on to something. 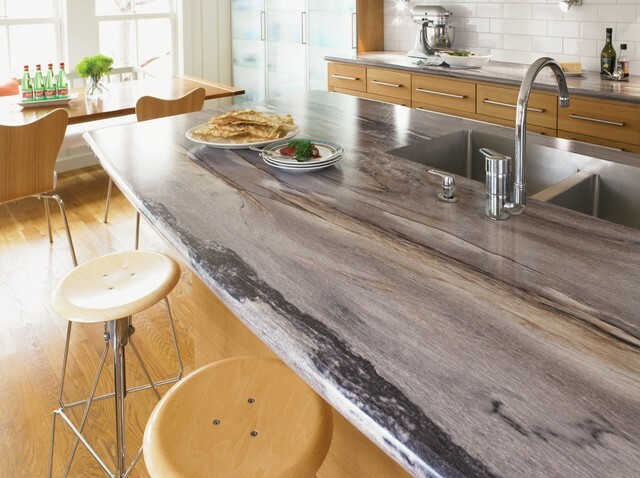 Just scanning all those super white kitchens where gray veined marble IS the pop-of-color left me craving 80s’ oak & Formica… Well, no. Although, I have taken to wearing sunshades when perusing Pinterest. When White will reach its Tipping Point is like timing the Stock Market: If only we had that super-human power. Perhaps when our continent literally tips under the weight of ALL that stone encasing every available surface. Btw, we both know that Paul will be required for mining the marble & lucky for you already has the equipment. One of problems with these kitchens is that there is no cat or dog hair billowing across the floor as there is in my house, so they don’t look like real kitchens. You just crack me UP! I cannot tell you what it means to me to start my day laughing out loud. LOVED the description of the Joneses. It was spot on, and they lived next to me while I was growing up, by the way! Screw trends. Create something that makes you HAPPY. If you want that damn faucet, buy it! Is there some kind of rule that you can’t buy another one later? Noooo! (Unless Paul has a list of rules somewhere.) So, knock yourself out, girlfriend! Can’t wait to see the mining pics! I threw my kitchen away three years ago. Who knew it would take me so long to get another one? Apparently, even small kitchens cost a lot. Good thing I like cereal. Yes! been throwing away, a few pieces at a time, for ten years. I am down to plywood subfloor, peeling drywall over peeling plaster and still no hope in sight for a reno. Says the woman who bought a house with a white kitchen with PINK countertops and beige Linoleum on the floor. I have no idea what era THAT was from!